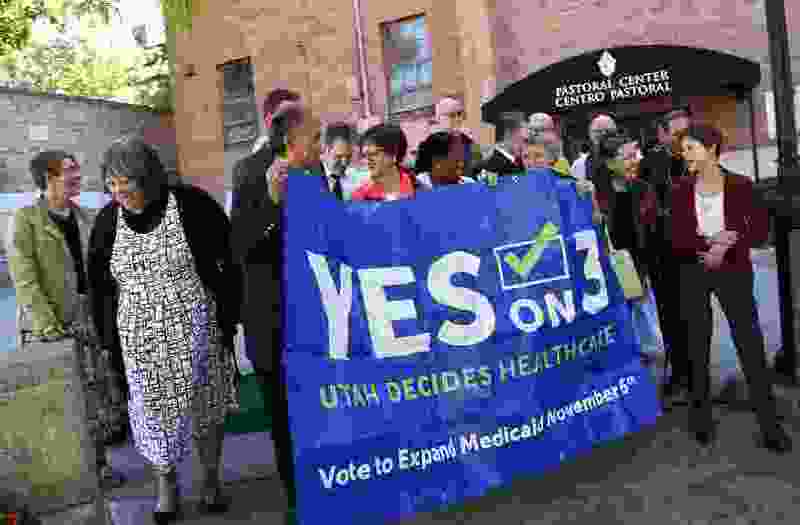 (Francisco Kjolseth | Tribune file photo) Utah faith leaders gather at the Cathedral of the Madeleine in Salt Lake City on Oct. 3, 2018, to make a joint statement in support of Prop 3, which would expand Medicaid in Utah. While voters passed Proposition 3, which would expand the program in Utah, its planned April launch could be moved back with health care benefits ultimately available to fewer individuals, under proposed legislation sponsored by Sen. Allen Christensen, R-North Ogden. An expanded Medicaid program in Utah is set to launch in April after 53 percent of the state’s voters approved Proposition 3 in November. But that launch date could be moved back, with health care benefits ultimately available to fewer individuals, under proposed legislation sponsored by Sen. Allen Christensen, R-North Ogden. 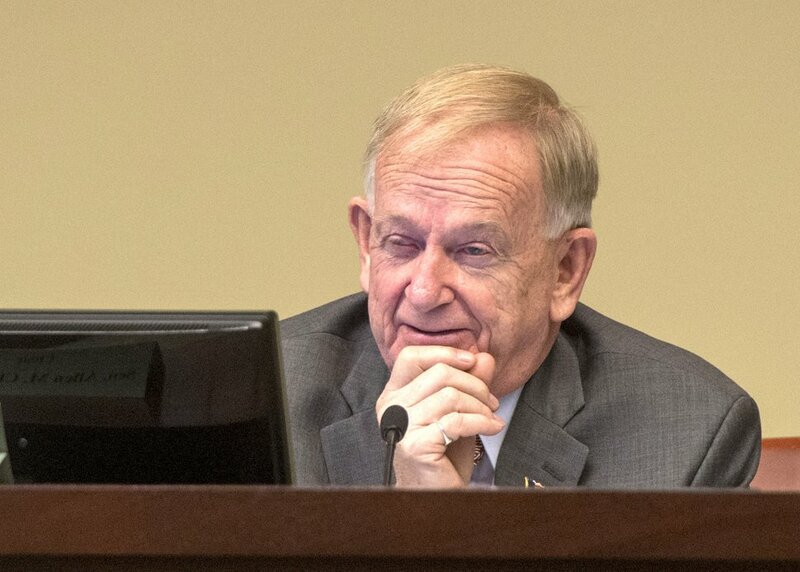 (Rick Egan | Tribune file photo) In this 2016 file photo, Sen. Allen Christensen, R-North Ogden, makes a comment during a Social Services Appropriations Subcommittee meeting during that year's legislative session. Christensen is proposing legislation that could push back the planned April rollout for Medicaid expansion in Utah with health care benefits ultimately available to fewer individuals. Those “guardrails” include a cap on Medicaid enrollment and work requirements for beneficiaries, Christensen said, with the intent to maintain solvency within the state’s Medicaid system, which provides health care to people living in poverty. “Prop 3 did not provide for enough money to do what it claims it’s going to do,” Christensen said. But initiative supporters, including AARP Utah Director Alan Ormsby, say Proposition 3 provides enough money to address the state’s increased health care costs. Ormsby said a “cushion” of roughly $15 million was built into the initiative’s sales tax hike — an increase of 0.15 percent on nonfood items — and that a combination of state and federal funding is sufficient for the initial expansion and future years. Ormsby also criticized imposing work requirements on beneficiaries — an idea state officials have pushed in the past — saying that it does little to incentivize productivity, causes patients to lose access to health care and imposes costly complications to the administration of Medicaid. “The idea that this is going to push people into the workforce who otherwise would be sitting on the sidelines — I think that’s nonsense," Ormsby said during a Wednesday meeting with The Salt Lake Tribune editorial board. Under Prop 3, $800 million in federal funding will be combined with roughly $90 million in new state sales tax revenue to provide health care to roughly 150,000 low-income Utahns. The expansion plan, approved by the state’s voters, superseded a scaled-down expansion approved by lawmakers last year that would have imposed work requirements on a smaller pool of Medicaid beneficiaries, with no additional state investment. The state’s plan was approved in March but had yet to be approved or denied by federal administrators when voters approved Proposition 3 in November. Christensen said his proposed legislation would similarly require a federal waiver, because it departs from the requirements of the Affordable Care Act, or Obamacare. Expansion of Medicaid — including the sales tax increase — would be delayed until that waiver is approved, Christensen said, likely postponing the April 1 launch for weeks, if not months. Utah lawmakers have long been critical of Medicaid expansion, debating and ultimately rejecting several expansion plans since the ACA’s passage. An incremental expansion offering coverage to the neediest Utahns was approved in 2016, followed by the partial expansion plan approved last year in response to Prop 3. The initiative was one of three to qualify for the November ballot and ultimately be approved by Utah voters. Proposition 2, which legalized medical marijuana for qualifying patients with a doctor’s recommendation, was replaced by lawmakers during a special session in December. And Proposition 4, which creates an independent redistricting commission to recommend voting maps in the state, is opposed by legislative leaders and expected to face amendments, litigation or both. Another Utah lawmaker said he would sponsor a bill to fully repeal Prop 3, only to walk back those comments after the results of the election. And Gov. Gary Herbert in November said he opposed repealing the initiative, but that adjustments may be needed to protect the state financially. On Wednesday, Herbert’s spokesman Paul Edwards said the governor has long argued for a careful expansion of Medicaid in order to return hundreds of millions of taxpayer dollars to the state and fix a hole in Utah’s safety net. Christensen said he’s concerned about the potential public reaction to his bill after the controversy surrounding the Legislature’s actions toward Prop 2 and medical marijuana. But he added that the backers of the Medicaid initiative made mistakes while writing Prop 3 that need to be corrected. He said it’s better to adjust Medicaid expansion now, rather than allow Prop 3 to proceed and restrict access down the road when costs increase. “I don’t have the heart to kick people off once they’re on there,” Christensen said. But Ormsby said the assertions of runaway costs are speculative and fail to take into account the “intangible” benefits to states that expand Medicaid. A healthier population is a healthier state, he said, which benefits the economy. AARP Utah was among the financial and organizational backers of Prop 3, contributing roughly $250,000 to the initiative effort, according to Advocacy Director Danny Harris. Harris said his organization and other initiative supporters are in the process of mounting opposition to Christensen’s proposals, including assessing precinct-level vote results to identify lawmakers who represent areas with higher levels of support for Medicaid expansion.